Extrusion blow molding has several advantages and disadvantages. It’s important to know these before undertaking the task. One advantage is the revolutionary technology. 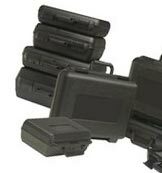 Extrusion blow molding revolutionized the way companies operate because they can use it widely to meet the needs of consumers when creating plastic carrying cases. It offers quick manufacturing and high volume outputs. Blow molding also allows multiple methods of production. There are various methods used to create a final product. Extrusion blow molding is similar to glass blowing. In this method materials are blown through a long tube to work on the end. This technique can create several products, such as a light bulb. Extrusion blow molding promotes a high level of productivity. This technology is being moved forward so it can be universally used in the production of plastic. It allows a significant increase in production capabilities, which in turn produces greater quantities in a shorter period of time. One more advantage of extrusion blow molding is that it offers the benefits of automation. This is an automated production method that allows for minimal flash (excess polymer) around the material, seamless part incorporation and increased speed of production, thanks to the precise receptacle it creates. When creating a custom carrying case, extrusion mold blowing is definitely a technique to look into. You will just need to determine if the pros outweigh the cons for your company when creating blow molded cases.